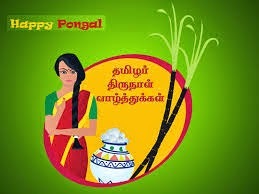 Happy pongal to all who celebrate it.For the people who don't know what pongal is ,its the harvest festival of Tamilnadu,India.On this day people prepare sweet and salt pongal in new earth wares before sun rise.I make them often and i love this sarkarai pongal a lot.Let us now see how people sweet pongal easily now. 1.Clean rice well.Heat a tsp of ghee in a cooker( i used my small one) and roast the dal well.Then add in cleaned rice,water,milk and salt.Pressure cook till the dal & rice are cooked well. 2.Switch off and wait for the steam to settle down.open the cooker mash well.add the jaggery,crushed cardamon to it and mix well.heat it and cook it low flame till everything blends well.Switch off. 3.Fry cashew and raisins in ghee and add to it. Easy and tasty sarkarai pongal is ready. 1.Since my jaggery/vellam was clean i just add it straightly.If you doubt then make syrup with 1\2 cup water and add the jaggery syrup. 2.You can add edible camphor if you like ,in our house no one like that flavour hence i didn't add. Very nice and tempting dish. Love it.